Since 2009, participants in Prosci’s research have been sharing insights about the roles of change management professionals in their organizations. 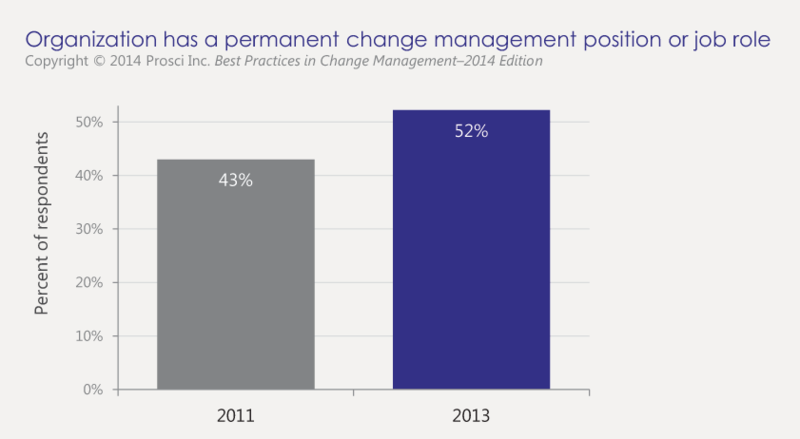 In Prosci’s 2013 benchmarking study, 52% of participants cited having a permanent job role for change management in their organization, up from 43% in 2011. A change manager will play a key role in ensuring projects (change initiatives) meet objectives on time and on budget by increasing employee adoption and usage. This person will focus on the people side of change, including changes to business processes, systems and technology, job roles and organization structures. The primary responsibility will be creating and implementing change management strategies and plans that maximize employee adoption and usage and minimize resistance. The change manager will work to drive faster adoption, higher ultimate utilization of and proficiency with the changes that impact employees. These improvements will increase benefit realization, value creation, ROI and the achievement of results and outcomes. While the change manager may or may not have supervisory responsibility, this person will have to work through many others in the organization to succeed. The change manager will act as a coach for senior leaders and executives in helping them fulfill the role of change sponsor. 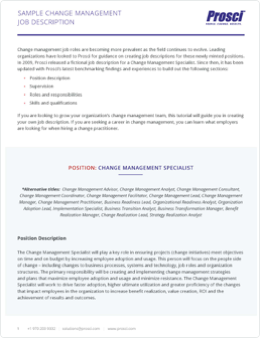 The change manager may also provide direct support and coaching to all levels of managers and supervisors as they help their direct reports through transitions. The change manager will also support project teams in integrating change management activities into their project plans.